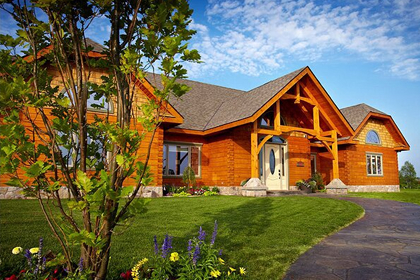 Naturally Perfect Wood Protection for log homes. Your log home is a monument to your unique taste and personality. It tells the world that you won’t just settle for the status quo. So why settle for an average stain? Not only does a log home require protection from sun and rain, but the sheer size of the wood demands a coating that “breathes” freely to prevent moisture from getting trapped and rotting the log from within. 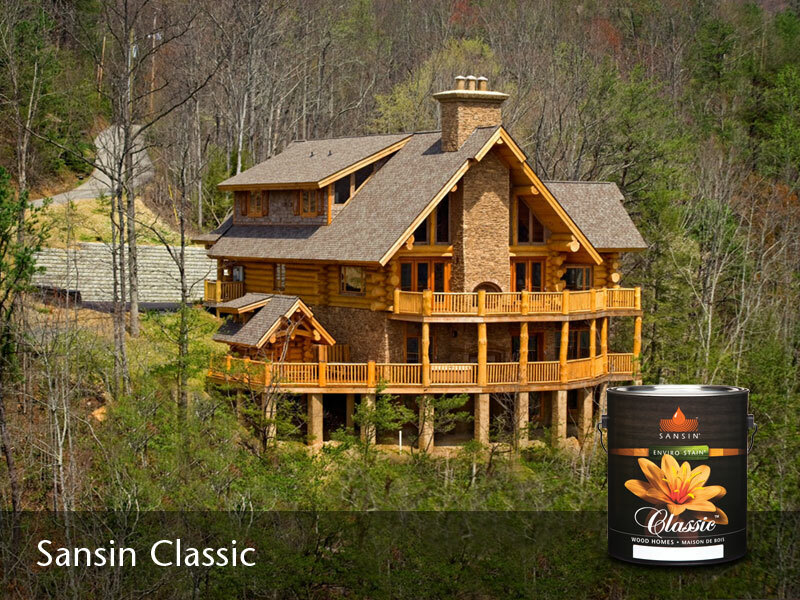 Sansin’s penetrating Enviro Stains are specially designed to protect the natural beauty of your log home. 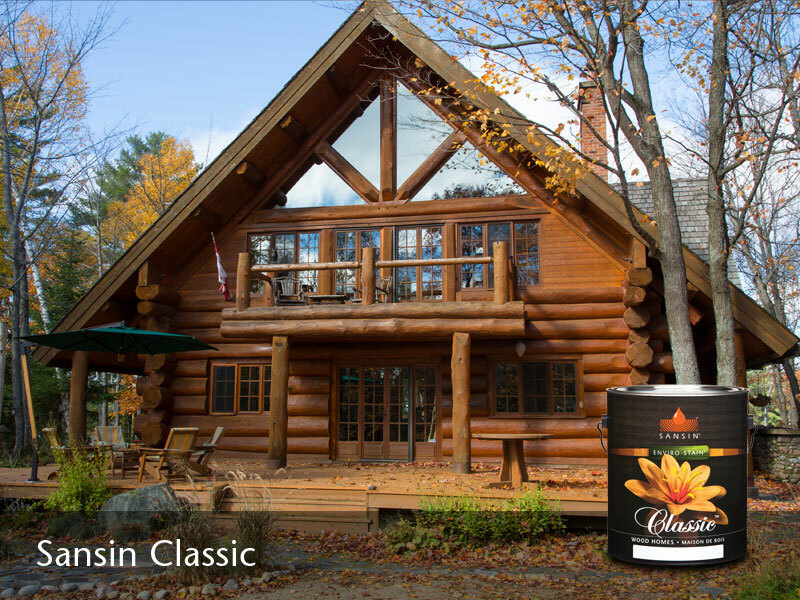 Because they use water to carry modified natural oils deep into the logs, the Sansin Classic system and SDF can be applied even to wood with a high moisture content – particularly useful for log homes where moisture levels of 25% or more are common. By comparison, most water- and solvent-based coatings can only be applied to surfaces with moisture content conditions of 18% or less and once applied, are more likely to trap moisture deep within the logs. As logs age and dry, they tend to check and crack. With traditional coatings, a surface crack can be catastrophic, allowing water to penetrate and causing wood to decay. With Classic and SDF, checks only contribute to the unique personality of your home – the surface of your wood is already protected from within. And because it’s designed to wear gently with the passage of time, wood care involves only a simple cleaning and maintenance coat. Complete protection, inside and out. 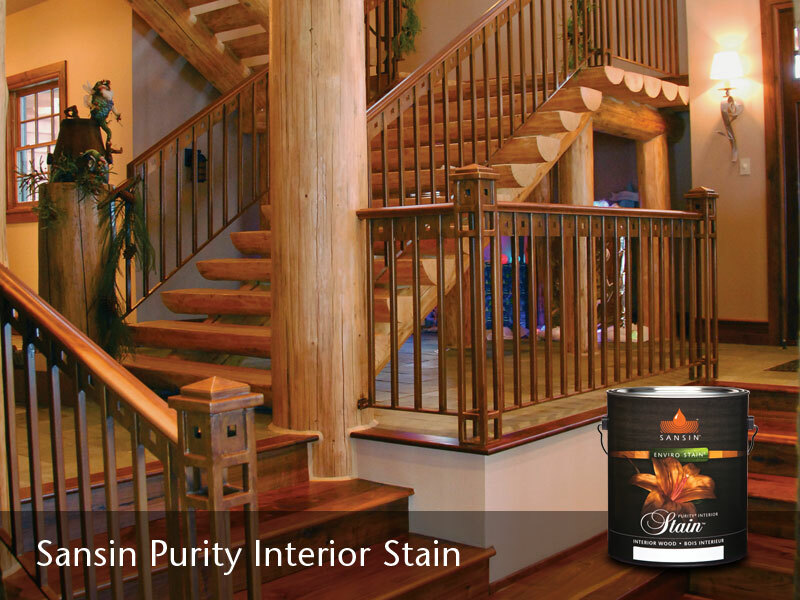 Enhance the beauty and character of your log home interior with the exceptional color and clarity of Sansin Purity. With three finishes – in addition to Purity Floor – and a wide array of colors, the effect you want to achieve is only limited by your imagination. 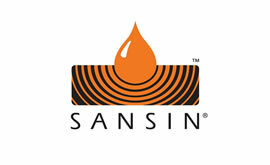 All Sansin Purity Interior formulations are low- or zero-VOC and easy to apply. Sansin also manufactures a complete line of chinking and sealant products, as well as log primers and coatings specifically designed to protect against rot, fungus and decay. What part of your home needs protection? 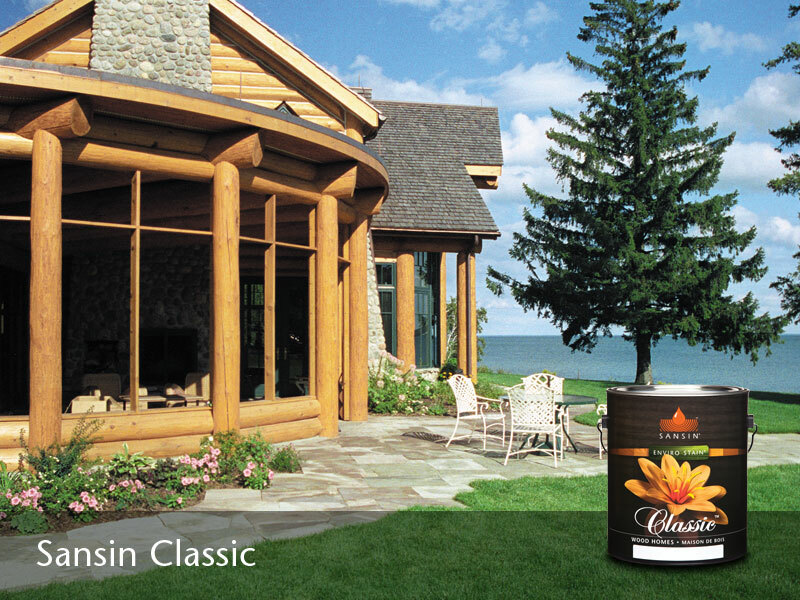 Whether you’re looking to protect and beautify the interior or exterior of your log home, Sansin has an Enviro Stain that’s right for your project. 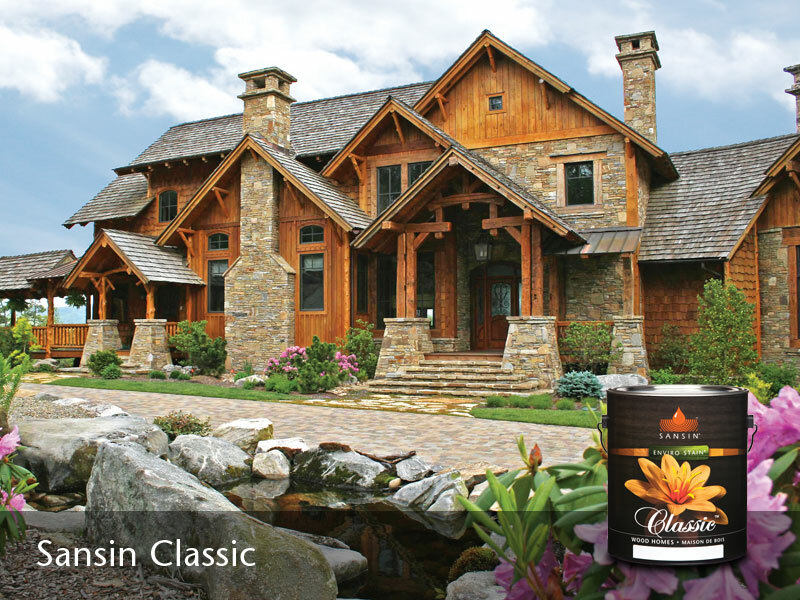 Scroll down for an overview of our family of log home protection products – or get inspired by browsing the Photo Gallery below for examples of beautiful log home projects featuring Sansin Enviro Stains. High-performance penetrating system for log homes. Penetrating environmentally-friendly three-coat system designed for big timber and logs in exterior applications. The first coat in the Sansin Classic system when natural wood tones are desired. The second coat in the Sansin Classic system for Natural tones; use as first coat for all other color tones. Final coat in the Sansin Classic system. Use for long-term maintenance and protection. Delivers a highly water-repellent finish and maintenance coat. Use over existing Classic finishes as a durable maintenance coat for additional water repellence and beading. Enhanced protection in either clear or solid color. For additional protection, top coat with this clear base tinted to your project specifications. Enhances base coats with a more saturated, finish in either clear or solid color formulas. Penetrating two-coat protection for decks. Perfect for all kinds of wood – pressure-treated, cedar, pine and more. Easily applied, easily maintained, exceptionally beautiful. Won’t crack, peel or blister. Beautiful premium finish for any project, new or old. Enhances the beauty of almost any wood surface with an exceptionally tough, durable finish. Highly resistant to wear and UV – available in satin or gloss. A clear top-coat for natural wood tones. Engineered as a top-coat finish or as a long-lasting maintenance coat for Natural ENS base colors. Resistant to wear, highly UV stable and loaded with UV inhibitors to prevent discoloration. Engineered as a top-coat finish or as a long-lasting maintenance coat for ENS base colors. Crystal-clear, resistant to wear, highly UV stable and loaded with UV inhibitors to prevent discoloration. Beautiful penetrating stain for wood interiors. Easy to apply without streaking and available in a wide variety of striking colors that enhance the natural beauty and grain of interior wood. 0-VOC penetrating gel stain for wood interiors. Penetrates slowly for additional working time and color control. Available in a wide variety of colors that enhance the natural beauty of wood. A two-coat finish that enhances the natural warmth of wood. Beautiful topcoat finish that enhances the natural tone and character of wood. Ideal for wood walls, doors, windows and furniture. Ultra-tough gymnasium grade finish for floors. Easy to apply, and durable, chemical- and scratch-resistant, Floor is the ultimate in beauty and protection for wood floors of all kinds. A crystal-clear finish for high-wear interior wood surfaces. Beautiful glass-like finish, available in clear or solid formulations, for cabinetry, walls, doors, windows, furniture and even floors. Penetrating oil for cabinetry and interiors. The perfectly natural finish for achieving a hand-rubbed look. Just one coat delivers rich, uniform character. Beautiful high-lustre finish for any project, new or old. Enhances the beauty of almost any wood surface with an exceptionally tough, durable finish. Highly resistant to wear and UV – available in medium or high-lustre. Beautiful one or two-coat water-borne wood finish. Industrial-strength wood treatment for in-yard protection. Protects against surface discoloration and weathering. Repels moisture and allows wood to breathe. Can be applied to both green and seasoned timbers. Penetrating base coat that improves top coat performance. Penetrating base coat that protects against weathering and UV. Easily topcoated – designed to enhance topcoat performance. Seals checks and cracks in logs and timbers. Zero-VOC compound that blends naturally with wood. Paintable and stainable, ideal for bare or finished log checks and cracks. A revolution in chinking technology. Log home chinking engineered for zero shrinkage and up to 400% elongation. Odorless, cures quickly and can be applied in cold temperatures.